The biggest challenge is getting to Coffee Monger’s Roasting Company. Although it’s relatively easy to find by car, the industrial estate being just off the A337 as it enters the north of Lymington, parking is tricky. There’s really nothing at Coffee Monger’s itself, and while there are a limited number of parking spaces on the main access road (Wellworthy Road), competition is fierce, so your best option maybe to park in the hospital pay-and-display car park and take a five-minute walk back. Coffee Monger’s occupies a standard industrial unit with a large, roll-up door on the right and a normal door (which customers use) on the left. Outside, in front of the roll-up door, which is usually open a short way, a transparent plastic cover hanging from the bottom to keep out any inclement weather, are a pair of picnic tables. Alternatively, head inside, where the front of Coffee Monger’s has been turned into a cosy coffee shop. Directly ahead of you, against the left-hand wall, is a two-group rocket espresso machine, while to the right of that is a high, counter-like table with three tall bar-stools. Opposite those, basking in the sun, is some more comfortable seating, including a sofa, back to the right-hand wall, and a gaggle of attendant armchairs. Beyond that a retail section is followed by, at the very back, the roastery itself. Meanwhile a mezzanine level occupies the back two-thirds of the space, accessed by stairs on the left-hand side, just past the espresso machine, but this is off-limits to customers. There are various menu boards around, detail the blends and single-origins on offer, plus you can peruse the bags of coffee themselves, while the staff will also talk you through the available options. The roaster, a 20kg Buhler from Switzerland, is at the back on the right, while there are also a pair of Probat sample roasters off to the left. During the winter, the roaster is in action at some point during most days, but during the summer, since it can get really hot, roasting is compressed into one or two days a week. The output is heavily focused on blends to cater for the local market, with the six blends covering a range of flavour profiles, using coffee from all the major growing regions, all of it speciality grade. There are also bespoke blends for select wholesale customers such as Lemana. However, Coffee Monger’s is slowing winning people over to the merits of single-origins, with a current slate of five, including a decaf. Coffee Monger’s started in 2015 and currently consists of Gareth, Tarek, Brook and Pippa. Tarek sources all the green beans and although I briefly met him, I was pretty lucky, since he’s often out of the country, visiting coffee farms. Instead, I was well looked after by Pippa and head-roaster, Gareth, while Brook was away (although I think that I met Brook at the London Coffee Festival). I started a flat white with the Hotfoot Jackson blend, using beans from Brazil, Costa Rica and Rwanda, a lovely, sweet, well-balanced coffee that went very well in milk. Afterwards, chatting with Gareth, he offered me a Chemex of a Honduras micro-lot, a lovely, fruity naturally-processed coffee which improved with every sip as it cooled. Then, sadly, it was time to go. 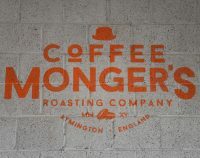 This entry was posted in Cafe/Roaster, Coffee Shops, Lymington, Meet The Roaster, Retailers, Roastery and tagged Coffee Mongers, include by Brian Williams. Bookmark the permalink.